Scoil Mhuire recognises the important role that sport plays in the development of students. Scoil Mhuire boasts excellent sporting facilities both indoors and out including a football field, outdoor basketball courts, large gym incorporating a full basketball court and three badminton courts, as well as a very well equipped exercise gym. The school provides sports such as: Gaelic Football, Hurling, Soccer, Volleyball, Orienteering, Badminton, Basketball, Rugby, Canoeing, Athletics, Swimming and Golf. In Scoil Mhuire we have our own canoes, which allow us to make us of the local rivers to teach this skill. Students are encouraged to compete in local, provincial and national competitions. 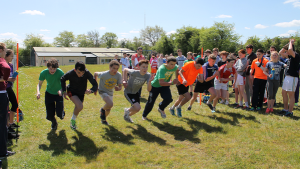 Scoil Mhuire also hosts an annual Sports Day where students compete in events such as 100m, 300m and 3km races along with the relay, shot, javelin, high jump. Sporting activities are also encouraged. There are training sessions for school teams held in the mornings or after school and include: GAA (boys hurling, football and ladies football), basketball, soccer and badminton. Circuit Training also runs an evening after school. We also encourage lunch time activities where students can take part in soccer, basketball, table tennis and badminton along with activities offered in the games room.